InMotion Hosting has been around since 2001, but it’s still one of the go-to providers for top-notch hosting with world-class infrastructure and spectacular customer support. With all its products, you get a lot of control over your hosting solution as well as powerful tools to make your website the best it can be. With such a wide range of products and pricing, almost anyone can find the right hosting solution at InMotion Hosting. With a presence that goes as far back as 2001, InMotion Hosting has grown to become one of the most popular and recognizable U.S.-based hosting providers – and it has 300,000 active domains to prove it. However, in this business, popularity doesn’t always mean quality. InMotion Hosting’s reputation is certainly impressive. The thing is, I’ve seen too many top hosting companies compromise on quality once they’ve grown to a certain size. Suddenly, performance and reliability are no longer what they used to be. Support quality can also deteriorate after being outsourced to save costs or simply overrun by a large customer base. I wanted to see if InMotion Hosting still provides a solid service and superior performance, just like it promises. InMotion’s diverse catalog has something for everyone, including WordPress and shared hosting, business hosting, reseller hosting, dedicated servers, and managed and unmanaged VPS. It also offers domain registration and web design services. In this review, I’ll be focusing on InMotion’s managed WordPress hosting. As the company’s primary focus is still a U.S.-based audience, it only provides services in English. It also only operates two data centers, both in the U.S. (Herndon, Virginia, and Los Angeles, California). InMotion Hosting’s managed hosting platform takes care of the backend, so you can focus on building your website. InMotion’s plans are quite convenient, including features like as multi-domain hosting, unlimited bandwidth, SSH access, a free SSL certificate, and no-downtime website migrations. With all these managed hosting essentials taken care of, you can spend your time working on your website, not messing around with its hosting. You can install virtually any app or CMS via the cPanel one-click installer. If you opt for a Business hosting plan, you can choose a CMS to be pre-installed by InMotion’s technical team. It’s no accident that InMotion Hosting’s two data centers are located at opposite ends of the United States. This allows you to choose the one closest to your target audience, whether you’re located in the U.S. or not. With the world-class peering network, you can avoid unnecessary routing between multiple network centers. According to InMotion, this means you could have up to six times faster email and downloading speeds in your most important markets. InMotion Hosting’s infrastructure is optimized for speed. NGINX, SSD storage, and advanced server caching should give your website’s performance an extra boost. Although you’ll have cPanel’s powerful tools at hand, you won’t need to use them much. With a managed WordPress hosting plan, many aspects of your hosting are handled for you, giving you the peace of mind to focus on managing your content and business strategies. One example is the security suite you get. It includes malware and hacking protection, DDoS protection, and automatic backups. Another is the automatic updates. You’ll know you’re always running on the newest technologies which will help keep your system stable and secure. Jetpack is THE plugin to have in your arsenal when hosting a WordPress website. It’ll power up your website in terms of security, performance, SEO, design, social media marketing, and more. The free Jetpack plan comes with InMotion’s WP-1000S plan. Higher-tiered plans will unlock more functionality. Some of the most important features in its suite are daily backups, priority support, an image and video CDN, Google Analytics integration, premium themes, and the ability to generate revenue through ads. BoldGrid is a premium WordPress plugin with a drag-and-drop website builder. It also comes packaged with professional WordPress themes of its own. It’s a very beginner-friendly builder that makes it easy to create beautiful, fully-responsive WordPress websites optimized for the top search engines. BoldGrid is included for free with all of InMotion’s WordPress plans. It can also be pre-installed when you sign up. You won’t find much to complain about using InMotion’s AMP (Account Management Panel). Sure, it might look slightly dated, but it’s a simple dashboard with straightforward navigation. You’ll find links to relevant help topics throughout the interface. Besides the Website Creator plans (InMotion’s website builder), all plans run on cPanel. The dedicated server and managed VPS hosting plans also come with WHM, and reseller hosting comes with WHMCS. There’s no doubt that these are some of the best hosting control panels in the industry. If you’ve used them before, you’ll appreciate the power and freedom they provide. All of the panels also come with the Softaculous script installer, which you can use to install hundreds of scripts for free with one click. If you’re familiar with cPanel, you’ll find InMotion very easy to use. If not, there may be a bit of a learning curve. The number of settings can be overwhelming and the interface isn’t as intuitive as some custom control panels. While setting up your hosting may not be as straightforward as with other beginner-friendly hosts like GoDaddy, all the documentation definitely makes it easier. When you sign up, you’ll get an email full of useful links. You can read how to connect your domain, install WordPress, set up a CDN, and more. During the onboarding process, your assigned support agent will provide you with valuable information and help with any concerns you might have. You’ll also find helpful links throughout your AMP. If you get stuck, you can open up the live chat from any page. InMotion doesn’t offer the quickest registration and setup processes. Having to speak with support staff via the phone to verify your account inevitably leads to extra delays. You get no guarantee as to how long it’ll take, although InMotion attempts to handle all cases within 30 minutes (during EST office hours). What I can say is that the support agent I spoke to was very helpful. If you want to see how long it took me to go through the entire sign-up process, click here. Besides the verification call, things were straightforward. It took me less than five minutes to purchase a plan and create an account. Overall, I thought the process was pretty good. There were only two upsells, and they were both unchecked by default. There were no hidden costs except for domain privacy. The total amount payable was always clearly displayed. Connecting your domain is easy as can be. If you provided your domain name during account creation, all you need to do is point your DNS records to InMotion’s nameservers. The support staff will take care of the rest. Unless you opted to have WordPress or BoldGrid automatically installed during sign-up, you’ll have to do it through cPanel. Jetpack gives you automatic access to a CDN, and you can upgrade your plan through your dashboard. With various WordPress optimization features and other recent improvements, you’ll find InMotion’s performance noticeably better. InMotion Hosting offers a 99.9% uptime guarantee for all hosting plans. According to multiple online sources, the uptime used to be pretty average, at just below 99.94% — but this has been steadily improving with time. Since April 2018, many reviewers have recorded uptimes of over 99.98%. Some even report 100% uptime. Let’s hope this trend continues. As for my own experience, I have no complaints regarding performance. There were never any noticeably slow loading times or dips in speed. WordPress was especially fast, with almost all pages loading instantly. Plugins and themes were installed in a flash. InMotion also gets great results on the Sucuri speed test. I created a test website with a template and a few plugins, which easily scored an A+ when I ran it through the Sucuri page load speed tool. The average load time in the U.S. was around 0.144 seconds. Los Angeles clocked in the quickest time at 0.037s, as this was the server location I chose. Even the slowest loading time — for India — was still under one second. InMotion’s performance outside of the U.S. is even more impressive, considering the fact that they don’t have any data centers abroad. I can only assume they must be doing WordPress optimization right. InMotion offers 24/7/365 customer support with all of its hosting packages. You can reach support via live chat, email, tickets, and dedicated phone lines. This is definitely one of the company’s major selling points. There’s also plenty of documentation and an active community of customers and support agents. I decided to put InMotion’s support to the test, with real, one-on-one interactions. I actually made my first support request as I was setting up my account. It took me a bit longer to get my welcome call and email. This meant I couldn’t access my hosting, despite having paid. I got the welcome email a couple of hours later, but still no activation call. I decided to call them instead. I had to get through a short dialing menu and hold for about 40 seconds. Then, I was put through to a friendly agent named Kaecy. It turned out the reason why I never got the initial call was that I was in a different country. That aside, Kaecy’s positive energy was reassuring, and the call was pleasant. It was just the right balance of providing me with the necessary information without taking up too much of my time. I also contacted InMotion multiple times through live chat. It can take a while to get a response if you catch them at a busy time. There were one or two cases when I had to wait over half an hour. I never got through in less than five minutes. Once I did connect with them, the support agents were always friendly, accommodating, and helpful. Each agent I spoke with went above and beyond to help me resolve my issues. If you happen to miss your session because you stepped away from the computer or it ended prematurely, they’ll also send you an email to apologize for any frustration and to let you know why your session ended. I’d rather get a faster response, but it is a nice touch. To try out the ticket support system, I opened a ticket asking how I could set up the Cloudflare CDN. I submitted it around noon EST, so I was expecting a fairly quick response. I received an email 25 minutes later. Not the shortest response time, but better than average. As you can see from the screenshot, they apologized for not offering the Cloudflare CDN with their packages and provided links to documentation on how to set it up. However, the support staff failed to mention that Jetpack actually does provide a level of CDN functionality. This is something I figured out myself later on. To be fair, Jetpack’s CDN is automatically activated when you host a website, so you don’t need to set it up. However, I still feel that someone should have provided me with this information. InMotion isn’t the cheapest service, but the higher-tier plans offer excellent value for your money. No matter what kind of hosting you’re looking for, InMotion probably has something for you. There’s WordPress hosting, website builder hosting, VPS, and even dedicated servers. If it’s WordPress you’re after, you have six packages to choose from. One little trick you’ll need to be aware of is that the prices displayed on the pricing carousels are actually for discounted one-year or two-year billing. The lower-tier plans don’t have billing terms shorter than a year, unfortunately. With the lower-tier plans, you can find similar feature sets at cheaper rates elsewhere, but the higher-tier plans include a ton of extra features and are excellent value for money. Keep in mind that InMotion only accepts major credit or debit cards and U.S. purchase orders. You can also create multiple user logins, which is great for teams. Website transfers, a domain (annually only for lower-tier plans), SSL certificates, and $150 worth of ad credits are also included for free. With the higher-tier plans, you’ll score a free domain even if you choose the monthly billing option. InMotion offers a 30-day money-back guarantee on all hosting products, with a few exceptions: for WordPress hosting or long-term business, VPS, or reseller hosting, you get a generous 90-day money-back guarantee — you certainly don’t see that every day. Unfortunately, you can’t cancel your account from your dashboard. You can deactivate automatic renewal, but if you want to get your money back, you’ll have to contact support via live chat, email, support ticket, or phone. Still, it was quite easy to cancel my InMotion account and get my refund. The support agent didn’t question my decision at all, everything was handled smoothly, and I got my money back within two days. Just be aware that you’ll lose access to your account immediately after requesting the cancellation. You can read how well InMotion handled my entire cancellation and refund process. InMotion Hosting scored well in all aspects, particularly support and performance. I can confidently say that InMotion Hosting is still one of the best U.S.-based providers for managed WordPress hosting. The fantastic infrastructure means it’s also one of the best in terms of performance and availability, no matter what type of hosting you’re looking for. You’ll appreciate the superb customer support, comprehensive documentation, and active community. The only downside is that because of InMotion’s popularity, you’re not likely to get an instant response through live chat — but waiting times aren’t long for phone or email support. 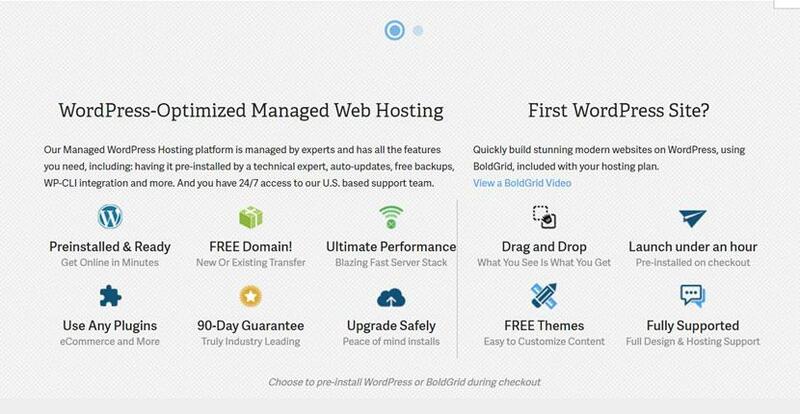 You’ll also get cPanel, which allows you to install almost any web application you need (including WordPress) in one click, you’ll have great freebies like BoldGrid and Jetpack to enhance your website. Wondering how InMotion Hosting stacks up against other Web Hosting companies? Enter any other Web Hosting company and we will give you a side-by-side comparison.